Submitted by Alexander on Thu, 05/01/2014 - 04:01. This page is sponsored by Sweetwater so you can click through to get the full specifications, the latest price, and purchase any of the effects and pedals that we here at GuitarSite.com have selected. From the first ever tremolo standalone effect unit, to the complex amp and effects modelers of today. Soon we will probably be plugging into a guitar hero modeler, which will convert our playing technique to that of the guitar hero profile we selected! While waiting for this level of technology to come along we decided to name the best guitar effects pedals currently available, from the most feature packed multi-effects units to time tested classic analog pedals. This table shows you all of the guitar effects and pedals in our top 10 list - scroll down below to read our extended reviews for each of these effects. With its huge number of modeled effects and amps, and its impressive sound - the Axe-FX II sits at the top of the heap of today's guitar processors. Fractal Audio claims this is the world's most powerful all-in-one guitar processor, and they are not bluffing because the unit is capable of modeling hardware thoroughly, down to the ICs, filter caps, choke, tubes, transformers and other minute details. This means that each preset is an accurate mathematical representation of the real thing. There are over 130 amp models onboard and they can be virtually wired to a variety of modeled stompboxes and rack effects that are also built-in. This great number of robust amp and effects models actually justifies the premium price that the Axe-FX II commands, this guitar processor is bounds and leaps cheaper compared to collecting and maintaining vintage and modern tube amps and effects! It doesn't end at just accurate modeling, Axe-FXII gives you the freedom to tweak many of the parameters to personalize your virtual rig. Online sharing of presets further expand the sounds that you can get from this rack-mountable unit. If you're not convinced yet, maybe knowing that some of the best guitar virtuosos were satisfied would change your mind, including Steve Vai, Guthrie Govan, John Petrucci, Tosin Abassi and the list is growing. Axe-FX II XL is currently retailing for just under $2,500. Visit Fractal Audio for the complete specifications. 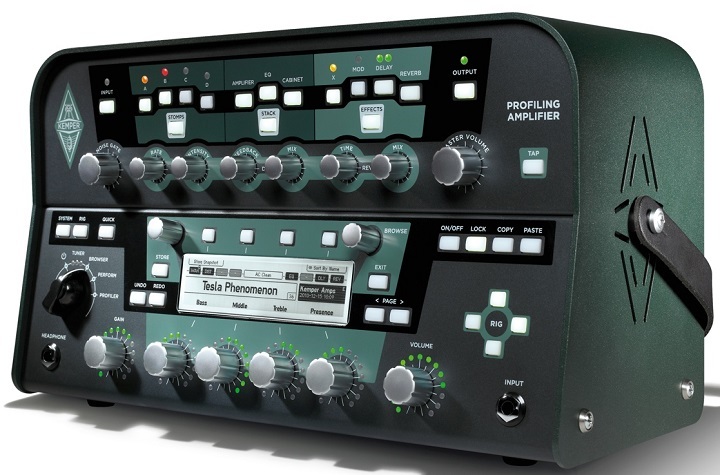 When I first heard how the Kemper Profiler can actually "profile" or copy guitar rigs, my jaw literally dropped. 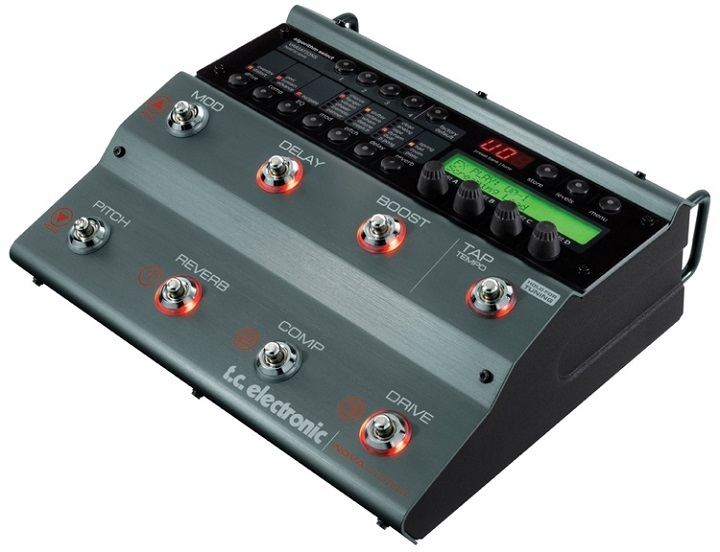 It impressively mimics the soul of a guitar rig and it does so in just a few minutes. The modeled rigs or "profiles" carry over impressive sonic details that amazes even the most battle-hardened analog purists. This voodoo-like technology will let you carry the sound, feel and dynamics of your pricey tube amps on the road - while leaving the actual hardware safe at home! You can also download other professionally captured "profiles" either from Kemper or from other users, easily expanding your digital rig. Although it does not provide expanded signal routing and effects chaining, many agree that the Kemper Profiler gets you as close to real rigs as possible. It does provide control over certain parameters should you need to tweak the sound - but as many users have noted - you rarely have to. The built-in effects are just as accurately and dynamically detailed as the amp profiles, but they are limited to only four effects slots. Stompbox profiling maybe the next phase for the Kemper and should be something to watch out for in future updates. In fact, the latest update included new and noteworthy effects that include the pitch shift and formant shift. Ola Englund and Steve Morse are just a few of the growing number of artists and studio cats that have incorporated this "lunchbox" to their live or recording rigs. Kemper Amps list the Kemper Profiler Head and Rack versions at $1,799, while the PowerHead and PowerRack amp versions are selling for $2,225. Get the latest price & reviews at Sweetwater.com. The POD HD series is easily the best bang per buck guitar processor in the market today. The POD HD500X in particular gives you hardware-like flexibility and impressive sonic quality, at a price point that neither the Kemper or Axe-FX can hold a candle to. Since I got a POD HD for myself, I have to admit that it has successfully kept my GAS(Gear Acquisition Syndrome) symptoms at bay, and I'm truly satisfied because it works as a multi-effects unit, an amp modeler and a recording interface - all packed in a sturdy unit that is easy to use. The POD HD500X is the latest floorboard to come out from this series. It features improved DSP for more chaining possibilities, while maintaining the same HD modeling technology from the previous models. If you feel that the HD modeled sounds are inadequate, you might be surprised just as I was when you see some of your favorite bands and guitarists play musical lines with their Line 6 guitar processors - just so they won't have to carry around their fragile and expensive vintage rigs. As far as sonic variety is concerned, you'll have more than enough with its over 30 HD modeled amps and over 100 modeled rack and pedal effects. You can also tweak each of the amps and effects for even more flexibility, even the Sag and Bias parameters for the amps are adjustable. Line 6 also continues to add amp and stompbox models when they upgrade the firmware, and the POD HD has a huge community of users who share their presets freely over the internet. More information is available at Line 6. The POD HD500X is currently retailing for just under $500, while the rackmountable POD HD Pro X costs more at $699.99. Get the latest price & reviews at Sweetwater.com. This Top 10 Guitar Effects list would not be complete without the mention of the Boss brand, and its only fitting to give a spot for their flagship amps and effects processor, the GT100. This powerhouse guitar processor features the company's latest COSM modeling technology. They boast that they have meticulously recreated the sound of some of the most popular vintage amps and stompboxes down to the fine details, and reviews have been in agreement with their claim. My experience with the pedal tells me that some of the factory presets may not be as endearing, but I was able to get great sounding presets after some tweaks. Thankfully this unit is probably the easiest guitar processor to setup! As expected, the GT100 excels in the effects section, with 44 effects that feature the virtually same sounds found on their stompbox pedals. Note that the GT100 was just recently updated to version 2.0, adding two new amp models and Boss' innovative Multi-Dimensional Processing (MDP) technology via the addition of three new effects that include A-DIST, Overtone and Tera Echo. These new effects created quite the buzz when they were launched as stand alone pedals. The GT100 scores high points in terms of durability, this is a given especially since this unit comes from Boss USA. Finally, this guitar processor rivals the Line 6 POD HD500X in terms of value for your money - you can buy a Boss GT100 for $500. Get the latest price & reviews at Sweetwater.com. While other guitar processors went down the amp modeling route, the Nova System stayed true to the multi-effects label - focusing on providing analog quality effects in a compact and easy to use format. With just 28 effects set up in 7 blocks, the Nova System may not have as many effects as the other processors in this list, but it more than makes up with the impressive sonic quality of each of the effects included. Most noteworthy is the Nova Drive Technology (NDT), which features all-analog distortion and overdrive circuits that can be controlled digitally. There's no modeling going on in this section, just true analog circuits that are separated from the digital effects. The result is great sounding dirt tones that, in my opinion, are enough to justify the Nova System's price tag! The other blocks include Compression, EQ & Noise Gate, Modulation, Pitch, Delay and Reverb. Each one of these effects share the same sonic quality as TC Electronic's standalone pedals, carrying the brand's distinctively transparent way of letting the nuances of your playing shine through each effect. If you already have a good amp or you are looking for a straightforward effect unit that carries great tones, then you should checkout the TC Electronic Nova System, which is currently currently retailing for $349.99. Get the latest price & reviews at Sweetwater.com. 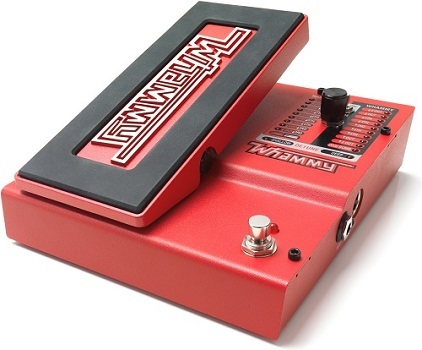 There's no downplaying the Tube Screamer's impact on guitar music. After more than 3 decades of being in production, it continues to be the most essential tool for guitar players, and even competitors agree that it has become the standard by which other overdrive pedals are measured against. With iconic players like Stevie Ray Vaughan stepping on the TS808 Tube Screamer, scores of aspiring guitar players followed suit, making the TS808 among the most used pedals in history. 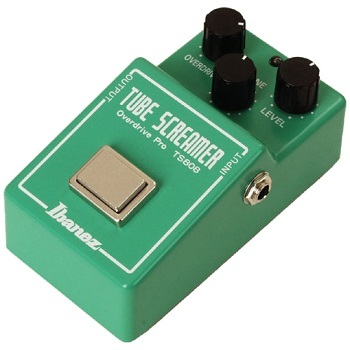 So if you are sitting there wondering what the Tube Screamer is, then you owe it to yourself to at least give one a spin. The TS808 stays true to the classic green stompbox, featuring the same JRC4558D integrated circuit that produces the pedal's familiar warm and subtle clipping overdrive. Each one of these ICs are thoroughly tested to ensure they meet the company's performance standards. I describe the pedal as the most straightforward and organic sounding overdrive there is. As expected, everything about original pedal's analog circuit path is carefully reproduced. As a plus, Ibanez utilized more reliable modern components, which means that if you get a TS808 today, it will probably survive to see the pedal's centennial anniversary. The original Ibanez TS808 Tube Screamer remake is priced at $180. Get the latest price & reviews at Sweetwater.com. With so many modern pedals to choose from, it is quite impressive that many guitar players still incorporate an old pedal like the Cry Baby Wah into their pedalboards. Its continued popularity is a testament to its simple and effective design. 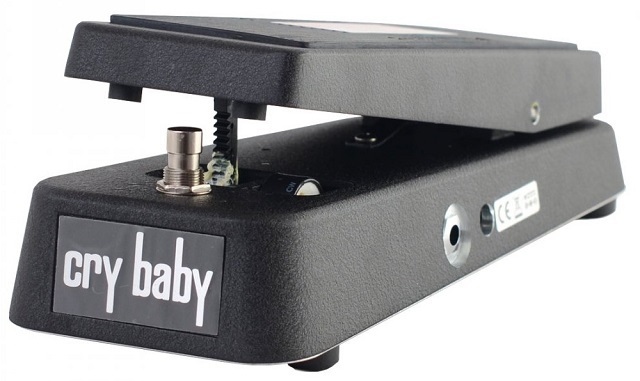 Like guitar greats Jimi Hendrix and David Gilmour, we all appreciate the expressive capabilities brought about by the Cry Baby Wah Wah effect. I personally prefer it used on soulful percussive funky rhythm lines. Even though the Wah pedal is rarely used on popular songs, it is just too cool to pass up on. Which is why it is no surprise that every guitar player and their grand pa has a Wah Wah pedal somewhere in their signal chain. Dunlop ensures that the original Wah Wah's funky flavor is passed down to the current production model GCB95 Cry Baby. It still uses the same mid-range boost design, which morphs your guitar tone to give it organic human-like "wah" sounds as you rock the pedal back and forth. The Original Cry Baby is currently retailing for just under $80, Jim Dunlop also offers a wide variety of other Cry Baby models, each with their own sonic flavor and features at different price points. Get the latest price & reviews at Sweetwater.com. When I first heard Joe Satriani do incredible dives and bends, I just had to find out how. My quest for an answer led me to the Digitech's revolutionary foot controlled pitch shifter. My quest for an answer led me to the Digitech's revolutionary foot controlled pitch shifter. Only a few modern pedals can claim that they changed the landscape of guitar playing, and of these Digitech Whammy stands on top of the heap. It was so revolutionary at the time of its release that it became its own unique pedal category. The Whammy is designed to simulate the sound of a vibrato bridge, but with a crazy range of pitch to play with. This extended note range attracted players that want to go beyond the scope of their guitar's fretboards, which aside from Satriani includes Steve Vai, Tom Morello, Dimebag Darrel, David Gilmour and even Jimmy Page. Continuing this spirit of innovation, the current Whammy is now on its 5th generation. It now features upgraded technology that allows for polyphonic pitch shifting, which means that you can bend entire chords up or down. Other features from older models are retained, including the classic single note mode pitch-shifting, 2-note interval harmony and two detune modes. If you've been stuck in a rut and want to inject fun into your rig and playing, visit Digitech to check out the Whammy V. It is currently retailing for just under $220. Get the latest price & reviews at Sweetwater.com. 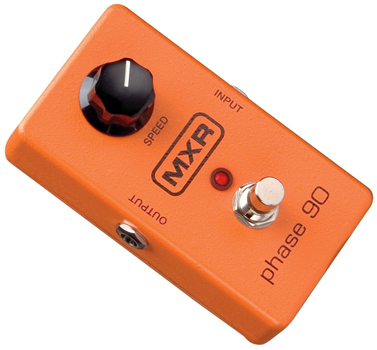 Versatility does not always equate to more knobs, case in point is the ever popular MXR Phase 90. This phaser pedal is versatile not because you can tweak it, but because its subtle effect easily works with various styles of music! The obvious advantage of the Phase 90 is its simplicity and ease of operation. You just plug in, set the speed, and just trust the pedal to give you the same classic sounding phaser effect every time you play. While other manufacturers strive to provide as much control as possible, this orange pedal stayed true to its simplistic format of having just one knob and one footswitch when it was first released in 1974. And looks like it worked well because this orange pedal etched the MXR brand in the minds of guitarists worldwide. The most popular user of the MXR Phase 90 is no less than guitar virtuoso Eddie Van Halen. He was able to incorporate the effect into many of his band's popular recordings, applying subtle shimmer to his lead passages and at times adding swoosh to his strumming. Classic pedals normally command ridiculous price tags, but not this one, Phase 90 is currently selling online for around $80 - all the more reason to add this Jim Dunlop pedal to your rig. Get the latest price & reviews at Sweetwater.com. Thanks to guitar icons like Jimi Hendrix, Eric Johnson and many others, the Fuzz Face helped mold today's "rockstar" image of the electric guitar. It transformed the wimpy electric guitar sound into a distinct tone that's very raw, explosive and in your face. And its interesting to note that the concept behind the effect is so simple, "fuzz" essentially mimics broken amps or torn speakers! It's quite ironic that we have to plug in this pedal to a proper amplifier to make it work! Today's Dallas-Arbiter Fuzz Face is based on the same circuit used by the original ones released in the '60s. It retains the Germanium PNP transistor design of the original, and provides two simple knobs that control the volume and fuzz level. It can be used to recreate classic out-of-control fuzz tones or you can apply it subtly to your overdriven tone and be as smooth as Eric Johnson. 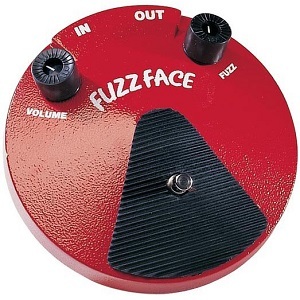 To please as many guitar players as they can, the Fuzz Face now comes in a number of different models, with each one featuring slightly different components. 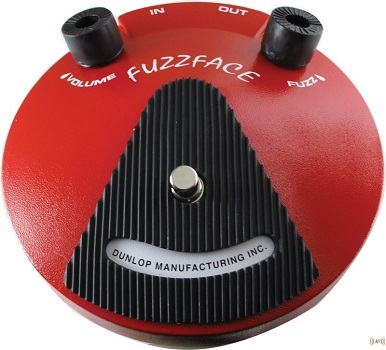 Check out the various Fuzz Faces at Dunlop. The Fuzz Face is currently retailing for around $130. Get the latest price & reviews at Sweetwater.com. Click here for our list of the best guitar effects software. Are you thinking about getting a Volume Pedal? If you are then check out our roundup here. Posted by Alex Cardoza on Sat, 02/25/2017 - 01:47. I've played with my Cry Baby 95Q for like 5 years. They never talking about the knob inside that controls the shut off timing.